2003-10-10 Assigned to CRYOVAC, INC. reassignment CRYOVAC, INC. ASSIGNMENT OF ASSIGNORS INTEREST (SEE DOCUMENT FOR DETAILS). Assignors: MCALLISTER, LARRY B., SCHWARK, DWIGHT W., SPEER, DREW V.
A multilayer film includes a first and second outer layer each including a polymer; and an internal layer including an oxygen scavenger; wherein at least one of the first and second outer layers includes a blend of a polymer, a siloxane having a viscosity of from 1×107 centistokes to 5×107 centistokes, and an antiblock agent. A laminate is also disclosed, including a multilayer film having an oxygen scavenger layer, and a layer including a blend of a polymer, a siloxane having a viscosity of from 1×107 centistokes to 5×107 centistokes, and an antiblock agent. This application claims the benefit of U.S. Provisional Application Nos. 60/442,875 filed Jan. 27, 2003, and 60/443,750 filed Jan. 30, 2003. 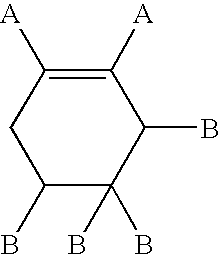 “Ethylene/alpha-olefin copolymer” (EAO) herein refers to copolymers of ethylene with one or more comonomers selected from C 3 to C10 alpha-olefins such as propene, butene-1, hexene-1, octene-1, etc. in which the molecules of the copolymers comprise long polymer chains with relatively few side chain branches arising from the alpha-olefin which was reacted with ethylene. This molecular structure is to be contrasted with conventional high pressure low or medium density polyethylenes which are highly branched with respect to EAOs and which high pressure polyethylenes contain both long chain and short chain branches. EAO includes such heterogeneous materials as linear medium density polyethylene (LMDPE), linear low density polyethylene (LLDPE), and very low and ultra low density polyethylene (VLDPE and ULDPE), such as DOWLEX™ or ATTANE™ resins supplied by Dow, ESCORENE™ or EXCEED™ resins supplied by Exxon; as well as linear homogeneous ethylene/alpha olefin copolymers (HEAO) such as TAFMER™ resins supplied by Mitsui Petrochemical Corporation, EXACT™ resins supplied by Exxon, or long chain branched (HEAO) AFFINITY™ resins supplied by the Dow Chemical Company, or ENGAGE™ resins supplied by DuPont Dow Elastomers. In a first aspect of the present invention, a multilayer film comprises a first and second outer layer each comprising a polymer; and an internal layer comprising an oxygen scavenger; wherein at least one of the first and second outer layers comprises a blend of a siloxane having a viscosity of from 1×10 7 centistokes to 5×107 centistokes, and an antiblock agent. The multilayer film can alternatively comprise a first layer comprising a blend of a polymer, a siloxane having a viscosity of from 1×10 7 centistokes to 5×107 centistokes, and an antiblock agent; a second layer comprising an oxygen scavenger; a third layer comprising a polymeric adhesive; a fourth layer comprising a polyamide; a fifth layer comprising an oxygen barrier; a sixth layer comprising a polyamide; a seventh layer comprising a polymeric adhesive; and an eighth layer comprising a polymer. The polymer of the first and eighth layers can comprise one or more of e.g. ethylene/alpha olefin copolymer, ethylene/vinyl acetate copolymer, polypropylene, ionomer resin, ethylene/acrylic or methacrylic acid copolymer ethylene/acrylate or methacrylate copolymer, and low density polyethylene. The polymeric adhesive of the third and seventh layers can comprise any or all of e.g. ethylene/vinyl acetate copolymer, anhydride grafted ethylene/vinyl acetate copolymer, anhydride grafted ethylene/alpha olefin copolymer, anhydride grafted high density polyethylene, anhydride grafted polypropylene, and anhydride grafted ethylene/acrylate copolymer. The polyamide of the fourth and sixth layers can comprise any or all of e.g. polyamide 6, polyamide 9, polyamide 10, polyamide 11, polyamide 12, polyamide 6,6, polyamide 6,10, polyamide 6,12, polyamide 61, polyamide 6T, polyamide 6,9, copolyamide 6I/6T, and copolyamide 6/6,6. The oxygen barrier of the fifth layer can comprise any or all of e.g. polyester, polyvinyl alcohol, ethylene vinyl alcohol copolymer, polyethylene naphthalate, polyamide, copolyamide, polyacrylonitrile, acrylonitrile copolymer, liquid crystal polymer, SiOx, polyvinyl chloride, polyvinylidene chloride, vinylidene chloride copolymer, carbon, metal, and metal oxide. The multilayer film can alternatively comprise a first layer comprising a blend of a polymer, a siloxane having a viscosity of from 1×10 7 centistokes to 5×107 centistokes, and an antiblock agent; a second layer comprising an oxygen scavenger; a third layer comprising a polymeric adhesive; a fourth layer comprising a polyamide; a fifth layer comprising an oxygen barrier; a sixth layer comprising a polyamide; a seventh layer comprising an amorphous polyamide; an eighth layer comprising a polymeric adhesive; and a ninth layer comprising a polyamide, polyester or polypropylene. In a second aspect of the present invention, a laminate comprises a multilayer film comprising a first layer comprising a blend of a polymer, a siloxane having a viscosity of from 1×10 7 centistokes to 5×107 centistokes, and an antiblock agent; a second layer comprising an oxygen scavenger; and a third layer comprising a polymer; and a substrate bonded to the third layer of the multilayer film. The substrate can comprise a plastic such as a polyethylene terephthalate, an oriented polyamide or an oriented polypropylene; a paperboard, or a metal. The plastic substrate or paperboard can optionally be coated with an oxygen barrier material. In some embodiments, the third layer comprising a polymer may be unnecessary, so that the substrate can be bonded directly to the oxygen scavenger layer. The UHMW siloxane polymer is a polydimethylsiloxane polymer which can have a viscosity in the range of e.g. from 1×10 7 cSt (centistokes) to 5×107 cSt, such as from 2×107 cSt to 4×107 cSt. In embodiments where the UHMW siloxane polymer is not crosslinked, it will flow like a molten polymer. Useful properties such as a reduced film-to-film coefficient of friction and improved abrasion resistance, typically observed with high molecular weight (between 1×104 cSt and 6×104 cSt) siloxane polymers, have been found when the UHMW siloxane polymer is utilized in combination with an antiblock agent. The UHMW siloxane polymer can be incorporated at any suitable use level, e.g. from 5,000 ppm to 50,000 ppm, such as from 10,000 to 40,000 ppm, and from 20,000 to 30,000 ppm, based on the overall weight of the surface layer in which the siloxane polymer is present. Because of their much higher molecular weight, UHMW siloxane slip agents do not migrate and accumulate at surfaces and interfaces and thereby result in a degradation of surface/interfacial properties such as heat seal, ink adhesion, lamination, etc. When compounded in a polymeric resin to form a surface layer, the UHMW siloxane polymer typically forms a micro-dispersion with a particles size range of between 0.5 and 5 microns. High oxygen barrier multilayer films and laminates can be made from materials having an oxygen permeability, of the barrier material, less than 500 cm 3 O2/m2·day·atmosphere (tested at 1 mil thick and at 25° C. according to ASTM D3985), e.g. less than 100, less than 50, and less than 25 cm3 O2/m2·day·atmosphere such as less than 10, less than 5, and less than 1 cm3 O2/m2·day·atmosphere. Examples of polymeric materials with low oxygen transmission rates are ethylene/vinyl alcohol copolymer (EVOH), polyvinylidene dichloride (PVDC), vinylidene chloride/methyl acrylate copolymer, polyamide, and polyester. Oxygen scavenging structures can sometimes generate reaction byproducts, which can affect the taste and smell of the packaged material (i.e. organoleptic properties), or raise food regulatory issues. This problem can be minimized by the use of polymeric functional barriers. Polymeric functional barriers for oxygen scavenging applications are disclosed in WO 96/08371 to Ching et al. (Chevron Chemical Company), WO 94/06626 to Balloni et al., and copending U.S. patent application Ser. Nos. 08/813,752 (Blinka et al.) and 09/445,645 (Miranda), all of which are incorporated herein by reference as if set forth in full, and include high glass transition temperature (T g) glassy polymers such as polyethylene terephthalate (PET) and nylon 6, including oriented PET and nylon 6; low Tg polymers and their blends; a polymer derived from a propylene monomer; a polymer derived from a methyl acrylate monomer; a polymer derived from a butyl acrylate monomer; a polymer derived from a methacrylic acid monomer; polyethylene terephthalate glycol (PETG); amorphous nylon; ionomer; a polymeric blend including a polyterpene; and poly (lactic acid). The functional barriers can be incorporated into one or more layers of a multi-layer film or other article that includes an oxygen scavenging layer. To determine the oxygen scavenging rate of the films, two methods were used to prepare the films. In both cases, film samples were UV irradiated with either a Cryovac Model 4104V Scavenging Initiation System (SIS) unit or an Anderson/Vreeland unit to give a dose of 700-800 mJ/cm 2 of UV C. In one method, irradiated films of well-defined area (usually 200 cm2) were then vacuum packaged in barrier pouches (P 640™, Cryovac division of Sealed Air Corp.) having an oxygen transmission rate (OTR) of 5 cc/m2/day). The pouches were inflated with 300 cc of nitrogen atmosphere at about 1% residual oxygen. In the second method, irradiated film samples were either used directly as lidstock, or first taped to a Cryovac R660™ barrier, non-oxygen scavenging laminate film when an oxygen barrier was not included, on a Multivac 230™ packaging machine, along with bottom web (T6070™, Cryovac division of Sealed Air Corp.). Gas flushing with the same 1% residual oxygen was also utilized. Samples were then stored at 4-5° C. (refrigerated) for the duration of the test. Portions of the headspace were periodically withdrawn and analyzed for oxygen with a Mocon PAC CHECK™ model 400 or 450 oxygen analyzer. The average oxygen scavenging rate was calculated by considering only the end points, with the following formula: Average Rate=cc O 2 scavenged/(m2·Δday), and in these examples was calculated 4 days after UV triggering. The peak (instantaneous) rate is the highest scavenging rate observed during any sampling period, and is given by: Δ cc O2 scavenged/(m2·Δday), where Δ is the incremental change between two consecutive measurements. Measurements are typically taken on the day of triggering and after 1, 4, 7, 14, and 21 days after triggering. Rates are further reported as the mean of at least three replicates. PET1 Terphane 22.00 ™ Terphane Inc.
the Werner & Pfleiderer or Bestorff compounders. Organoleptic test results for laminated high-slip OSFilms ™. 2. The multilayer film of claim 1 wherein the polymer of the first and second outer layers comprises a material selected from the group consisting of ethylene/alpha olefin copolymer, ethylene/vinyl acetate copolymer, polyamide, polyester, maleic anhydride modified polyolefin, ionomer resin, ethylene/acrylic or methacrylic acid copolymer, ethylene/acrylate or methacrylate copolymer; and low density polyethylene. 4. The multilayer film of claim 1 comprising a photoinitiator selected from the group consisting of benzophenone and its derivatives, tribenzoyl triphenylbenzene, tritoluoyl triphenylbenzene, thioxanthen-9-one, isopropylthioxanthen-9-one, 2,4,6-trimethylbenzoyidiphenylphosphine oxide, bis(2,4,6-trimethylbenzoyl)phenylphosphine oxide, ethyl-2,4,6-trimethylbenzoylphenyl phosphinate, bis(2,6-dimethoxybenzoyl)-2,4,4-trimethylpentyl phosphine oxide, and 4-benzoyl-4′-methyl(diphenyl sulfide). 5. The multilayer film of claim 1 comprising an oxygen barrier layer, disposed between the internal layer comprising the oxygen scavenger, and one of the first and second outer layers, the oxygen barrier layer having an oxygen transmission rate of no more than 100 cc/m2/24 hr at 25° C., 0% RH, 1 atm (ASTM D 3985). 6. The multilayer film of claim 5 wherein the oxygen barrier comprises a material selected from the group consisting of polyester, polyvinyl alcohol, ethylene vinyl alcohol copolymer, polyethylene naphthalate, polyamide, copolyamide, polyacrylonitrile, acrylonitrile copolymer, liquid crystal polymer, SiOx, polyvinyl chloride, polyvinylidene chloride, vinylidene chloride copolymer, carbon, metal, and metal oxide. 7. The multilayer film of claim 1 wherein the kinetic coefficient of friction (film surface to film surface) of the film is 0.4 or less (ASTM D1894-99). 8. The multilayer film of claim. 1 wherein the average oxygen scavenging rate of the film is at least 20 cc/m2/day four days after an oxygen scavenging property of the film is activated. 9. The multilayer film of claim 1 wherein the film is cross-linked. 10. The multilayer film of claim 1 wherein the film is biaxially oriented and heat shrinkable. b) a substrate bonded to the third layer of the multilayer film. 12. The laminate of claim 11 wherein the polymer of the first and third layers comprises a material selected from the group consisting of ethylene/alpha olefin copolymer, ethylene/vinyl acetate copolymer, maleic anhydride grafted polyolefin, ionomer resin, ethylene/acrylic or methacrylic acid copolymer, ethylene/acrylate or methacrylate copolymer; and low density polyethylene. 14. The laminate of claim 11 comprising a photoinitiator selected from the group consisting of benzophenone and its derivatives, tribenzoyl triphenylbenzene, tritoluoyl triphenylbenzene, thioxanthen-9-one, isopropylthioxanthen-9-one, 2,4,6-trimethylbenzoyldiphenylphosphine oxide, bis(2,4,6-trimethylbenzoyl)phenylphosphine oxide, ethyl-2,4,6-trimethylbenzoylphenyl phosphinate, bis(2,6-dimethoxybenzoyl)-2,4,4-trimethylpentyl phosphine oxide, and 4-benzoyl-4′-methyl(diphenyl sulfide). 15. The laminate of claim 11 comprising an oxygen barrier layer, disposed between the second layer comprising the oxygen scavenger, and at least one of the first and third layers, the oxygen barrier layer having an oxygen transmission rate of no more than 100 cc/m2/24 hr at 25° C., 0% RH, 1 atm (ASTM D 3985). 16. The multilayer film of claim 15 wherein the oxygen barrier comprises a material selected from the group consisting of polyester, polyvinyl alcohol, ethylene vinyl alcohol copolymer, polyethylene naphthalate, polyamide, copolyamide, polyacrylonitrile, acrylonitrile copolymer, liquid crystal polymer, SiOx, polyvinyl chloride, polyvinylidene chloride, vinylidene chloride copolymer, carbon, metal, and metal oxide. 17. The laminate of claim 11 wherein the average oxygen scavenging rate of the laminate is at least 20 cc/m2/day four days after an oxygen scavenging property of the laminate is activated. 18. The laminate of claim 11 wherein the substrate comprises a polymeric film. 19. The laminate of claim 11 wherein the substrate comprises a metal. 20. The laminate of claim 11 wherein the substrate comprises a paperboard. MXPA05007702A MXPA05007702A (en) 2003-01-27 2004-01-23 Oxygen scavenging film with high slip properties.